Taking a picture of the iPhone, iPad or iPod touch screen is something that most owners know. But still there are a lot of users who don’t know they can take a screenshot of their device and save it to their photos’ library. Here’s a quick tip on how to capture your device screen. The process of taking a picture of your iOS device screen is the same on all devices. 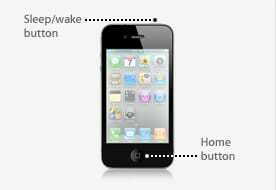 To take a screenshot of your iPad, iPhone or iPod touch all you have to do is to press the Home and Sleep button simultaneously, then release them at the same time. The picture of the screen will be instantly taken as soon you press Home and Sleep button. After that, the screenshot will be saved to your Camera Roll’s album. Screenshot taken with iPod touch with no camera will be saved to Photos Album.